The 2017 RAM 2500 and 3500 in Scottsdale are two top-of-the-line options for heavy-duty and dependable truck shoppers in the Phoenix area. 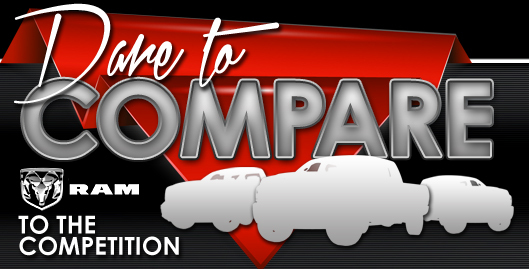 These models have only slight differences, but the choice comes down to their towing and hauling capabilities, which each truck offers plenty of. Both of these trucks are highly functional, equipped with modern features and comfort, as well as impressive power and strength. 2017 RAM 2500 and 3500 reviews highlight their versatility and range of options that make them ideal everyday trucks for all drivers. Each 2017 Ram 2500 and 3500, as well as their 4500 and 5500 cousins, comes in a wide variety of trims, as well as several cabin configurations, bed lengths and engine options. 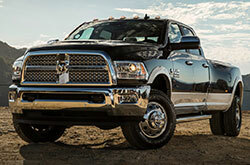 The cab styles are the standard two-door, four-door crew cab and four-door Mega Cab, which is a larger variation of the traditional crew cab. Standard features across all models include vinyl upholstery, heated mirrors, a six-speaker audio system, and AUX and USB ports, while the next-level SLT trim adds keyless entry, cloth upholstery, a 5.0-inch display and Bluetooth connectivity. 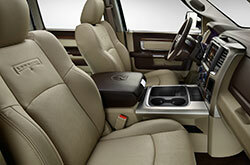 Moving up the trim levels, drivers will be able to add amenities, such as remote ignition, upgraded upholstery and a unique exterior look (Big Horn), alternate exterior styling, an upgraded sound system, leather upholstery and a rearview camera (Laramie), and heated rear seats, a navigation system and another exterior aesthetic variation (Laramie Longhorn). On the Limited trim, features such as the RAMBox cargo management system, keyless entry/ignition and premium leather upholstery come standard. The additional trim on the 2500 is the Power Wagon, which comes with off-roading amenities like all-terrain tires, tow hooks and a front anti-roll bar. Drivers considering the 2017 RAM 2500 and 3500 in Scottsdale can choose between three different engines, each with impressive power. A 5.7-liter V8 engine, which produces 383 hp and 400 lb.-ft. of torque and comes with a six-speed automatic transmission, comes standard on most 2500s and 3500s. One of the alternative options is a 6.4-liter V8 that generates 410 hp and 429 lb.-ft. of torque, while the other option, a 6.7-liter six-cylinder diesel engine, outputs 350 hp and 660 lb.-ft. torque. 2017 RAM 2500 and 3500 reviews take note of its easy handling, which is impressive for a truck of its size. 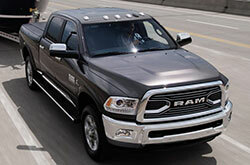 Reviews have also called out the trucks' maneuverability when off-roading or when hauling and towing. 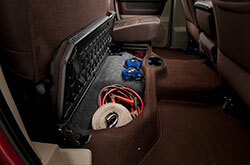 The 2500 has a maximum towing capacity of 17,980 lbs., while the 3500 is capable of towing up to 31,210 lbs. 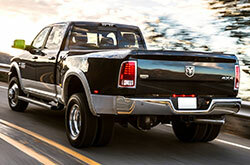 Standard safety features on each of these Ram trucks include an advanced set of airbags, stability control, speed control and a theft deterrent system. Moving up the trims, safety tech, such as parking sensors and hill descent control, are added as standard. These advanced features can also be equipped on lower trims, so talk to your salesperson today!